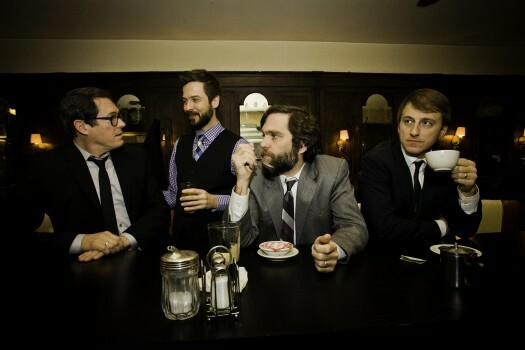 Tightrope, the sixth studio album from the Raleigh-based four-piece Chatham County Line, will be released May 20, 2014. Tightrope follows 2010’s winsome, soulful Wildwood and the career-spanning concert album and film undertaking of 2012’s Sight & Sound. Stirring, provocative, and disarmingly poignant, Tightrope was born out of a year’s worth of intense focus, during which the band examined their own legacy while carefully honing new material. All the while, the band’s four members – Dave Wilson (guitar), John Teer (mandolin, fiddle), Chandler Holt (banjo), and Greg Readling (bass, pedal steel, piano) – welcomed spontaneity and the sometimes palpable will of the songs themselves into the process. Recorded at Sound Pure Studios in Durham, NC and produced by Wilson and Chatham County Line, Tightrope benefits from an unusually rich, resonant sound that blends each member’s contributions into a powerful, dynamic whole. The poetic insight of the album’s eleven original songs is grounded by Chatham County Line’s ongoing commitment to classic stringband instrumentation. Listen to the band’s new song, “Any Port in a Storm,” from Tightrope in the player below, in addition to track listings and tour dates. Chatham County Line to release live 2xCD/LP + DVD box set, SIGHT & SOUND – Out 6/26.